Often in development aid, misery and natural disasters determine where the money goes. The tsunami that devastated Banda Aceh in 2004 could be seen all over the news for many weeks. The recent Haitian earthquake is still very present in many minds and may touch our conscience in such a way that we gladly give our money to respective development agencies. As a consequence, these places are swarmed with NGOs, IOs and private initiatives creating and realizing projects. Yet, isn’t that exactly the purpose of development aid? To help people in need? Yes, but meanwhile a disaster victim in Banda Aceh receives 5 tents, 7 pairs of shoes and tons of goods of development aid for years to come, children in the poorer regions of Africa, South America or elsewhere lack the public attention to attract comparable support. Relying heavily on organizations such as the UN Development Programme or US Aid, funding of projects in unknown and remote areas can be very difficult. It is a widespread practice that agencies, especially those which count on private financial contributions, use the “big disasters” to raise money and then redirect these funds to cross-finance smaller, less known projects in other regions. However, this practice is often prone to intransparency, fraud and improper management. Kickstarter.com, a US-based website, now shows development aid organizations how it can be done differently. Focusing mainly on cultural projects, Kickstarter.com acts as an intermediary between people with ideas and people with money to support good ideas. All the website does is offer space to the project initiators, which allows them to introduce their ideas and present them to people interested in funding those projects. Funders decide by themselves about the allocation of their money and smaller projects have an equal opportunity of being realized. Kickstarter.com is all about centralization and democratic choice. Coming back to development aid, imagine a web-based platform offering people a selection of respective funding opportunities to choose from. Would you rather support the program to construct a new school of a local municipality in Sudan? Or would you prefer funding the creation of sanitary installations in Central Asia? It is your choice! 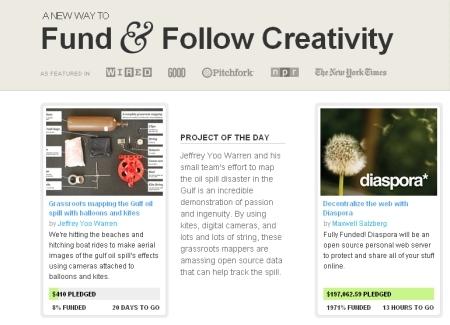 A website based on the logics and mechanisms of Kickstarter.com, yet meeting the specific requirements of development aid could facilitate fund-raising activities a lot. Moreover, it could activate people who prefer staying anonymous or who feel just intimidated by more confrontational campaigns. Improving the quality of development aid is not just about getting rid of shady projects and institutions, but about realizing efficiency gains by means of centralizing resources. For additional information about Kickstarter itself, click here.